Everybody knows that a good breakfast is the basis of a good day. Crispy bread, fresh cottage cheese, aromatic coffee makes you more eager to jump out of bed. And what if that breakfast was also served on beautiful tableware? Imagine golden honey dripping from a finely painted spoon, the smell of black coffee from a squat mug or original cup, and the breath-taking smell of scrambled eggs served on a unique dish made especially for you. Are you hungry yet? 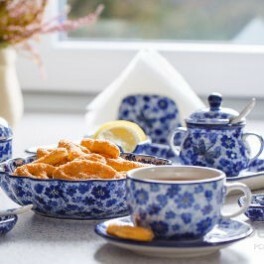 Why don’t you pamper yourself a bit with adequate tableware to serve your breakfast? Turn each morning into a small feast. Sit at a table with your family and enjoy your meal served on hand-painted dishes. With Bolesławiec tableware from DekorBuy, you sandwiches and eggs will taste like never before. Discover unique butter dishes, plates, cups, cutlery and many other products.